I don't always look at clothes when I'm out thrifting, but when I do I like to flip through the racks looking at labels first. When I come across a label from a decent store, then I step back and look at the garment. 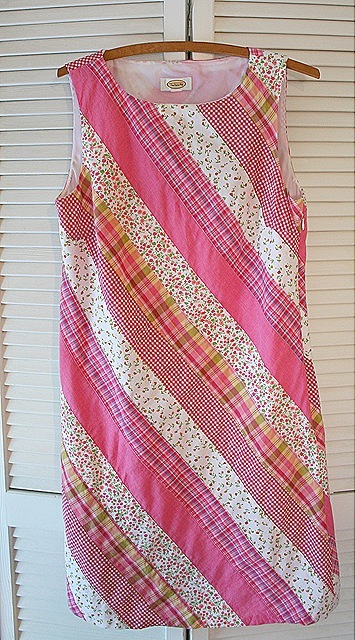 My most recent better label find is a chemise or shift from Talbot's in pretty pink gingham fabrics. I guessing from the 80's, maybe early 90's. Very Junior League but cute I thought. 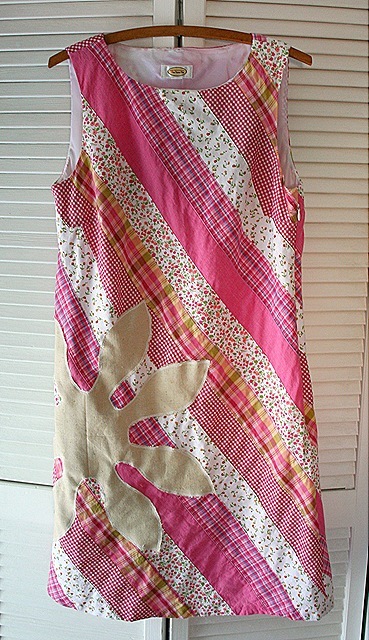 Nice enough and perfect for summer. But today I threw it under my sewing machine with a linen flower cut out and I'm diggin' my little update. I'm thinking I need to go back to the ironing board though and get rid of that crease in the flower because I'm going to wear this tonight to littlepeach#2's induction ceremony into the Junior National Honor Society. Love that! And I’m betting you looked much cuter at your little peach’s induction ceremony than I looked at mine! What an awesome find. Love the customization… nice work!